Students who thrive at the cutting edge of technology and want to take on the challenge of ensuring the integrity of aircraft carrying pilots, passengers, and precious cargo are right at home in the Department of Aviation Maintenance Science. 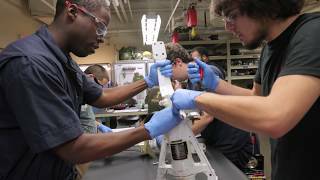 The department offers several programs, including a Bachelor of Science in Aviation Maintenance Science, an Associate of Science in Aviation Maintenance Science, and a minor in Avionics Line Maintenance. At the heart of each program lies the FAA Airframe and Powerplant (A&P) mechanic’s certification program. These highly hands-on degree A.S. and B.S. programs each include 47 credit hours of airframe and powerplant technical courses, plus the specific courses that will prepare graduates for meeting a growing demand for technicians to work for large aircraft manufacturers, airlines or commercial companies with small fleets, or contractors who overhaul and rebuild aircraft. Some also enter the growing field of avionics, working on unmanned aerial vehicles. Such a wide array of career and focus options offered by these degrees draws a diverse group of students, from those just out of high school to military veterans, career-changers, and international students. As a whole, students in this department like to solve problems, enjoy working with their hands, and have a strong background in mathematics and science. These students get plenty of real-life experience in the department’s Emil Buehler Aviation Maintenance Science Building. The 48,000-square-foot building is entirely dedicated to the training of airframe and powerplant technicians, with two of its three floors dedicated to labs. The department also has a hangar, turbine engine test cells, and several aircraft.